Public Security Minister, Khemraj Ramjattan on Friday insisted that sedition must be listed as an offence in proposed Cyber Crime legislation to crack down on those who use Facebook and other Internet-based media to threaten the stability of the government. “No, the existing provision does not cover it because this is now sedition by use of computer. Right now, the law that we have is largely sedition on the ground as it were. You go and take a microphone and you go on a public platform and you start causing civil stress, if you write things in the newspapers that can cause civil strife and disorder, whatever. But when you write it inside of a Facebook or by use of a computer, that ingredient is what we now want to capture and that is what the Cyber Crime Bill is doing,” he said. The Minister said there are a lot of offences, if committed on the Internet, could not be subject to charges. He contended that sedition is “tool” for the executive branch to deal with those who foment civil strife and disorder in countries such as the United States. Ramjattan, an experienced Attorney-at-Law, said although the United Kingdom has abolished sedition, that country’s Civil Disorder Act has incorporated other anti-violence provisions. 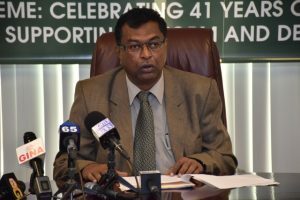 Ramjattan indicated that concerns raised by interest groups about Section 18 of the Bill would be re-examined, but he assured that another provision in the same Bill will guarantee Guyanese the right to freely criticise government, minister or calling for a lawful change of the government. “Still there are some concerns and we are going to meet those concerns by a formulation,” he said. Against the backdrop of concerns by organisations such as the Working People’s Alliance political party, Georgetown Chamber of Commerce and Industry and the Guyana Press Association, the Public Security Minister said the constitutional right to freedom of expression would not be infringed by the Cyber Crime Bill when it becomes law. “It is not as if we are going to affect freedom of expression- understand it in that context. We are saying clearly in subparagraph 4 that any criticism, whatever the criticism of government, it is not sedition but if you are out there doing certain things to cause civil strife and disorder, violence; certainly by your utterances it will,” he said. The Public Security Minister suggested that sedition, as a crime on Guyana’s law books, is necessary to counter border uprisings such as annexation by possession backed up supporting expressions in the media, Facebook and other Internet sources. Minister of Public Telecommunications, Catherine Hughes pointed out that the Cyber Crime Bill has been before a bipartisan parliamentary select committee since 2016 after when all organisations had an opportunity to make representation to that committee. Hughes reminded that even the opposition People’s Progressive Party (PPP) admitted to ‘dropping the ball’ by doing very little in the select committee for the past two years. The Public Telecommunications Minister questioned why civil society and non-governmental organisations failed to go through the proper channels to raise concerns. “If in two years, you don’t come forward and say anything you are the one that has to consider that you have not performed to the level that you should with regard to the stakeholders you represent,” she said. Former political activist, Mark Benschop and former Guyana Defence Force officer, Oliver Hinckson, former political activist and talk-show host Ronald Waddell had been charged with sedition under the PPP administration. AFC Leader, Raphael Trotman is already on record as saying that his party’s parliamentarians would vote against the currently formulated Cyber Crime Bill. “I can say that as presently constructed, I, as Leader of the AFC, cannot support Clause 18.1 in the Bill and will therefore be urging for an amendment, and if none is forthcoming, I will vote against it,” the privately-owned Kaieteur News newspaper has quoted Trotman as saying. The Cybercrime Bill states that a person commits an offence of sedition if the person, whether in or out of Guyana, intentionally publishes, transmits or circulates by use of a computer system, a statement or words, either spoken or written, a text, video, image, sign, visible representation, or other thing, that (a) brings or attempts to bring into hatred or contempt, or excites or attempts to excite disaffection towards the Government established by law in Guyana”. The legislation, if passed, will prohibit disaffection including disloyalty and all feelings of enmity”. At the same time, the Bill allows “comments expressing disapprobation of the measures of the measures of the Government with a view to obtain their alteration by lawful means, without, exciting or attempting to excite hatred, contempt or disaffection” and “comments that point out errors or defects in the Government, Constitution or Parliament”.